Ah, the 1980’s when it was totally ok to traumatized the child audience with creepy imagery, weird complex meta plots and harsh heart-break. This is where the 1984 movie The Neverending Story comes in. It was based on the first half of a book of the same name by Michael Ende . It was a West German English language movie. At the time it was the most expensive film produced outside the USA or the USSR. It also spawned two bad sequels, which I’m not getting in to. So nerdy, cowardly bibliophile, Bastian is getting chased by bullies and hides out in a creepy book store. He impressive the shopkeep with all the book he has read but the shopkeep tells him that the book he is currently reading is different. Bastian takes to book though he promises to return it. Bastian then skipped a math test to read the book in the school’s creepy attic. The story is about a world called Fantasia that is quickly being reduced to nothing. The Nothing is some kind of weird force engry thing erasing the world. The ruler of Fantasia, The Childlike Empress is somehow dying and she summons a warrior from the Plain people who hunt the Purple Buffalo, Atreyu to find a cure for her illness. Atreyu has to leave all him weapons behind but is given AURYN which like The Empress symbol and will protect him. 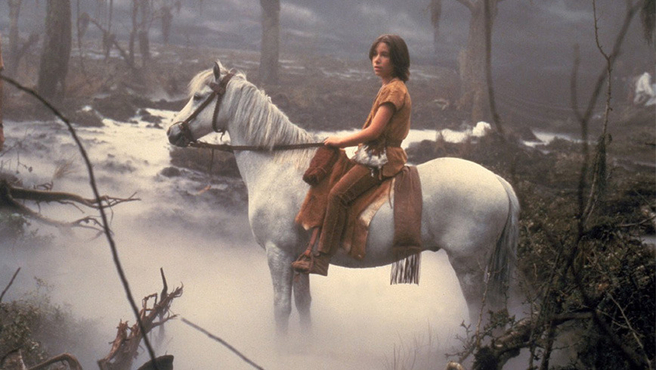 So off Atreyu goes on his quest with his horse pal Artax. They are being follows though by an agent of the Nothing, a wolf-like creature named Gmork. Atreyu literally wonder around aimlessly till he get an idea to ask a great old ancient one named Morla but to get there he has to go through the Swamps of Sadness. There if you let the sadness get to you, you drown. This what happens to Artax, he becomes sad, sinks, and dies, and if you don’t cry at this scene your heartless. Atreyu meets Moral who is a giant Turtle and is the mountain that Atreyu was standing on, this freaks out Bastian and his scream is heard by Atreyu and Morla. Anyway Morla is a little draft and not super helpful to Atreyu. Moral suggests that Atreyu go to the Southern Oracle who is 10,000 miles away. Atreyu despairs and in nearly caught by Gmork but he saved. He is saved, treated and brought close to the Southern Oracle by Falkor, a luck dragon who just like children. Atreyu then meets Engywook and Urgl. Engywook is an expert of the Southern Oracle and he shows Atreyu the first gate to get to the Oracles, The Sphinx Gate. Those who don’t know their own worth are killed by the gate. Atreyu tries to pass through but he loses his confidence. He does escape teh blast from the Sphinx’s eyes but Engywook bemoans that he didn’t tell Atreyu about the Mirror gate which shows a person’s true self. At the icy gate Atreyu sees Bastian reading the book, which freaks Bastian out and he throws the book but resumes reading. Atreyu gets to the Southern Oracles who tells him the only way to save the Empress is for a Human child to give her a new name. 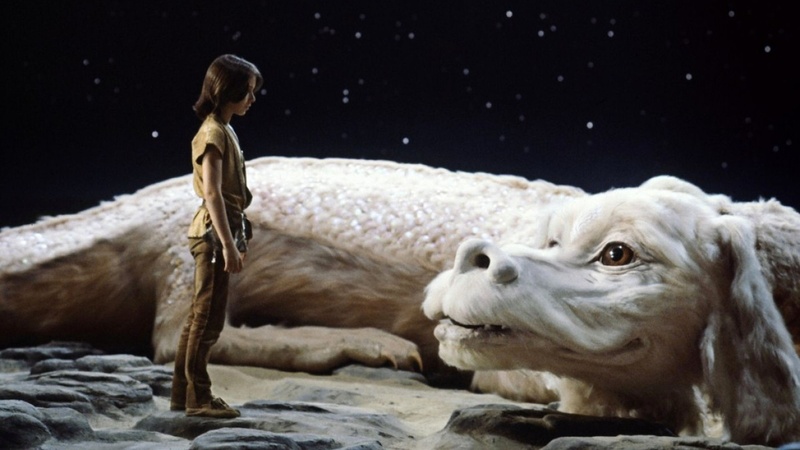 Atreyu tries to find the human child but Nothing hits them and he falls off Falkor and he loses AURYN. It’s here that Gmork shows up and tells Atreyu that Fantasia is a place made up of Human’s imagination amd the nothing is like adult apathy. He also says he in league with the nothing because with out Imagination and hope people are easier to control. Atreyu then kills Gmork. 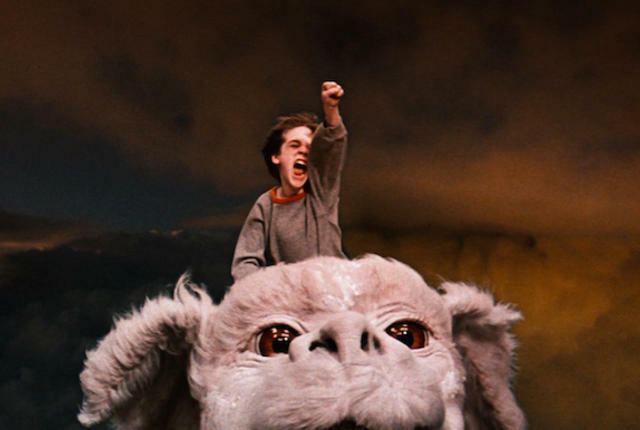 Falkor find AURYN and Atreyu but Fantasia is destory and it just bits of ground. Atreyu wonders if The Empress‘ seat of power, The Ivory Tower exists. They find it intact. Atreyu meets with the Childlike Empress. She tells him that Atreyu did not fail his quest and they he brought a Human child with him who has been with him on his quest. Bastian relieve she is talking to him. She begs him to give her a name. Bastian is hesitate but give her the name of Moon Child, which was his mother’s name, and I can hear him say Moon Child. The Empress shows Bastian the only bit of Fantasia that exists, a single grain of sand but through Bastian dreams and wish he can bring back Fantasia. Bastian then makes a wish to fly Falkor and scare the bullies. According to some, the book is better as it has more going on and Atreyu is green. I never read the book though I have heard the author didn’t really like the movie but let’s just keep to the film in question. So this story is REALLY complex, I’m not sure I can get my head fully around it. That or I’m trying too hard. The story makes it’s clear that Atreyu and Bastian are like two side of the same coin. Atreyu was picked because he was the one to appealed to Bastian and in turn Bastian is a surrogate for the audience watch him. So does that mean, if I were to read the story in the film’s context that I would get the same story but with a different character? Like the character I relate to does the same things as Atreyu, which really isn’t that much and I give the Empress a new name like I dunno Sally or Mabel Joy Snickerdoodle the Third? Or would be a different story? Or is the battle with the nothing and the the renaming the first time you read the book then after you get the Emptiness and the Babbies? Or something else. See what I mean about over thinking it? But there is this lovely philosophy that the movie has about the power of one’s imagination. As I mention before this movie has its moments of scaring children, both in the movie and to the audience. First this movie was very hard on the child actor who played Atreyu, Noah Hathway. He was hurt twice and nearly lost an eye. The role was also looked physically exhausting. But more than that there is the Swamp of Sadness scene where Artax dies and you can see Atreyu’s going through of the stages of Grief and really his performance makes that scene heartbreaking never to the horse just stand there. Also the horse didn’t really die, there was an elevator which admittedly hurt Hathaway and not the horse. The movie shows that you that child can take a lot of dark and sad imagery as long there is a happy ending and at the end Artax is alive again, though that scene will always get me. I’m a character person, I can forgive a lot if I like the characters. So how are the characters? Well, they are interesting in their simplicity. Most are not deep or fleshed out with engaging backstories, problems or flaws. The most developed character is Bastian since we get a sense him and he is the only was with flaws and a character arc of overcoming being a wuss and learning there is value is dreams and imagination. And even still his is annoying. The rest of the character have elegances to the way they presented in the movie. Their simplicity makes them likable in a effortless way. 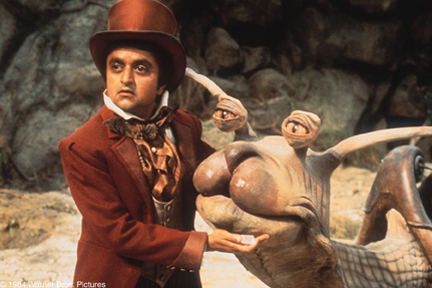 I would say for me my favorites character are Falkor and the Childlike Empress but the racing snail was so adorable so honorable mention. The technicals in this movie are lovely. Sure at time they look stagy but there is a nice lush and realness to them. It gives the movie a very unique look, tone and atmosphere. Everything looks like it was made to best of the ability at the time and it adds so much to feel of the fantasy. Also while costumes are really a focus in this movie, I love The Childlike Empress’s Art Noveau pearl white gown, it’s so pretty. As I just want to add, I love way the world feels very big and old in this movie. 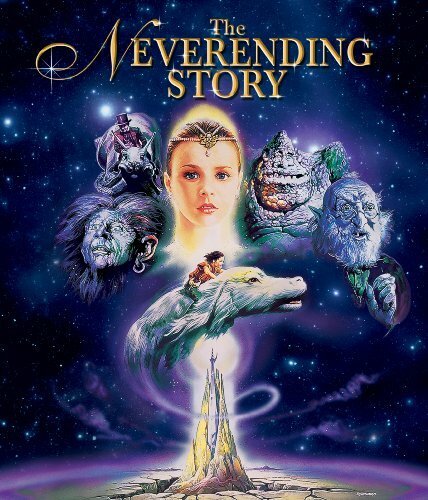 The Neverending Story is a classic example of 1980’s children fantasy. Is it a perfect movie? No, is fun and interesting? Yes!